Culture consists of the social behaviour and norms in human societies transmitted through social learning. Arthropods play many roles in human culture, including as food, in art, in stories, and in mythology and religion. Many of these concern insects, which are important both economically and symbolically, from the work of honeybees to the scarabs of Ancient Egypt. 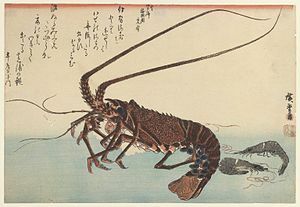 Other arthropods with cultural significance include crustaceans such as crabs, lobsters, and crayfish, which are popular subjects in art, especially still lifes, and arachnids such as spiders and scorpions, whose venom has medical applications. 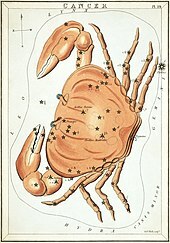 The crab and the scorpion are astrological signs of the zodiac. Culture consists of the social behaviour and norms found in human societies and transmitted through social learning. Cultural universals in all human societies include expressive forms like art, music, dance, ritual, religion, and technologies like tool usage, cooking, shelter, and clothing. The concept of material culture covers physical expressions such as technology, architecture and art, whereas immaterial culture includes principles of social organization, mythology, philosophy, literature, and science. This article describes the roles played by arthropods in human culture. The arthropods are a phylum of animals with jointed legs; they include the insects, arachnids such as spiders, myriapods, and crustaceans. Insects play many roles in culture including their direct use as food, in medicine, for dyestuffs, and in science, where the common fruit fly Drosophila melanogaster serves as a model organism for work in genetics and developmental biology. Crustaceans are an important source of food, providing nearly 10,700,000 tons in 2007; the vast majority of this output is of decapods: crabs, lobsters, shrimps, crayfish, and prawns. Over 60% by weight of all crustaceans caught for consumption are shrimp and prawns, and nearly 80% is produced in Asia, with China alone producing nearly half the world's total. Non-decapod crustaceans are not widely consumed, with only 118,000 tons of krill being caught, despite krill having one of the greatest biomasses on the planet. Lobsters are caught using baited, one-way traps with a colour-coded marker buoy to mark cages. Lobster is fished in water between 2 and 900 metres (1 and 500 fathoms), although some lobsters live at 3,700 metres (2,000 fathoms). Cages are of plastic-coated galvanised steel or wood. A lobster fisher may tend as many as 2,000 traps. Around 2000, owing to overfishing and high demand, lobster aquaculture expanded. As of 2008[update], no lobster aquaculture operation had achieved commercial success, mainly because lobsters eat each other (cannibalism) and the growth of the species is slow. Cooked tarantula spiders are a delicacy in Cambodia. Spiders are sometimes used as food. Cooked tarantula spiders are considered a delicacy in Cambodia, and by the Piaroa Indians of southern Venezuela – provided the highly irritant hairs, the spiders' main defence system, are removed first. Insects feature in a variety of ways in biomimicry, where for example the cooling system of termite mounds has been imitated in architecture. Because spider silk is both light and strong, attempts are being made to produce it in goats' milk and in the leaves of plants, by means of genetic engineering. The Ch'ol Maya use a beverage created from the tarantula Brachypelma vagans for a condition they term 'tarantula wind', the symptoms of which include chest pain, asthma and coughing. The peptide GsMtx-4, found in the venom, has been studied for possible use in cardiac arrhythmia, muscular dystrophy, and glioma. Possible medical uses for other spider venoms have been investigated for the treatment of cardiac arrhythmia, Alzheimer's disease, strokes, and erectile dysfunction. Arthropods appear in folklore, in mythology, and in religion. Since Insects in mythology and in religion are covered elsewhere, this section focuses on other arthropods. In the Japanese fairy tale "My Lord Bag of Rice", the warrior Fujiwara no Hidesato slays a giant centipede, Ōmukade, to help a dragon princess. Spiders have been depicted in stories, mythologies and the arts of many cultures for centuries. They have symbolized patience due to their hunting technique of setting webs and waiting for prey, as well as mischief and malice due to their venomous bites. The Italian tarantella is a dance supposedly to rid the young woman of the lustful effects of a bite by the tarantula wolf spider, Lycosa tarantula. Web-spinning caused the association of the spider with creation myths, as they seem to produce their own worlds. Dreamcatchers are depictions of spiderwebs. 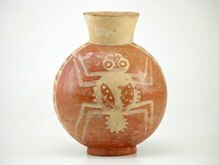 The Moche people of ancient Peru worshipped nature, emphasising animals and often depicting spiders in their art. The scorpion appeared as the astrological sign Scorpio, in the twelve signs of the Zodiac, created by Babylonian astronomers during the Chaldean period, around 600 BC. In South Africa and South Asia, the scorpion is a significant animal culturally, appearing as a motif in art, especially in Islamic art in the Middle East. A scorpion motif is often woven into Turkish kilim flatweave carpets, for protection from their sting. The scorpion is perceived both as an embodiment of evil and a protective force that counters evil, such as a dervish's powers to combat evil. In another context, the scorpion portrays human sexuality. Scorpions are used in folk medicine in South Asia especially in antidotes for scorpion stings. In ancient Egypt the goddess Serket was often depicted as a scorpion, one of several goddesses who protected the Pharaoh. Insects feature in art, in literature, in film, and in music. The "Lobster Quadrille", also known as "The Mock Turtle's Song", is a song recited by the Mock Turtle in Alice's Adventures in Wonderland, chapters 9 and 10, accompanied by a dance. The surrealist artist Salvador Dali created a sculpture called Lobster Telephone with the crustacean in place of the traditional handset, resting in the cradle above the dial. The Surrealist filmmaker Luis Buñuel used scorpions in his 1930 classic L'Age d'or (The Golden Age). ^ Ortega-Hernández, J. (2016). "Making sense of 'lower' and 'upper' stem-group Euarthropoda, with comments on the strict use of the name Arthropoda von Siebold, 1848". Biological Reviews. 91 (1): 255–273. doi:10.1111/brv.12168. PMID 25528950. ^ "FIGIS: Global Production Statistics 1950–2007". Food and Agriculture Organization. Retrieved February 24, 2010. ^ Steven Nicol; Yoshinari Endo (1997). Krill Fisheries of the World. Fisheries Technical Paper. 367. Food and Agriculture Organization. ISBN 978-92-5-104012-6. ^ "Global Capture Production 1950-2004". Food and Agriculture Organization. Retrieved August 26, 2006. ^ Asbjørn Drengstig; Tormod Drengstig & Tore S. Kristiansen. "Recent development on lobster farming in Norway – prospects and possibilities". UWPhoto ANS. Archived from the original on 2003-10-04. ^ Weil, C. (2006). Fierce Food. Plume. ISBN 978-0-452-28700-6. Archived from the original on 2011-05-11. Retrieved 2008-10-03. ^ "Spider Venom Could Yield Eco-Friendly Insecticides". National Science Foundation (USA). Retrieved 2008-10-11. ^ Hinman, M. B.; Jones J. A. & Lewis, R. W. (2000). "Synthetic spider silk: a modular fiber" (PDF). Trends in Biotechnology. 18 (9): 374–9. CiteSeerX 10.1.1.682.313. doi:10.1016/S0167-7799(00)01481-5. PMID 10942961. ^ Menassa, R.; Zhu, H.; Karatzas, C. N.; Lazaris, A.; Richman, A.; Brandle, J. (2004). "Spider dragline silk proteins in transgenic tobacco leaves: accumulation and field production". Plant Biotechnology Journal. 2 (5): 431–8. doi:10.1111/j.1467-7652.2004.00087.x. PMID 17168889. ^ M'Rabet, Salima Machkour; Hénaut, Yann; Winterton, Peter; Rojo, Roberto (2011). "A case of zootherapy with the tarantula Brachypelma vagans Ausserer, 1875 in traditional medicine of the Chol Mayan ethnic group in Mexico". Journal of Ethnobiology and Ethnomedicine. 7: 12. doi:10.1186/1746-4269-7-12. PMC 3072308. PMID 21450096. ^ Lewis, R. J. & Garcia, M. L. (2003). "Therapeutic potential of venom peptides" (PDF). Nature Reviews Drug Discovery. 2 (10): 790–802. doi:10.1038/nrd1197. PMID 14526382. ^ Bogin, O. (Spring 2005). "Venom Peptides and their Mimetics as Potential Drugs" (PDF). Modulator (19). ^ Andrade E.; Villanova F.; Borra P.; Leite, Katia; Troncone, Lanfranco; Cortez, Italo; Messina, Leonardo; Paranhos, Mario; Claro, Joaquim; Srougi, Miguel (2008). "Penile erection induced in vivo by a purified toxin from the Brazilian spider Phoneutria nigriventer". British Journal of Urology International. 102 (7): 835–7. doi:10.1111/j.1464-410X.2008.07762.x. PMID 18537953. ^ Gullan, P. J.; Cranston, P. S. (2009). The Insects: An Outline of Entomology. John Wiley & Sons. pp. 9–13. ISBN 978-1-4051-4457-5. ^ Balée William (2000). "Antiquity of Traditional Ethnobiological Knowledge in Amazonia: a Tupí–Guaraní Family and Time". Ethnohistory. 47 (2): 399–422. doi:10.1215/00141801-47-2-399. ^ de Visser, D. M. (1913). The Dragon in China and Japan. J. Müller. pp. 191–192. ^ Ettlinger, Ellen (1965). Review of "La Tarantella Napoletana" by Renato Penna (Rivista di Etnografia), Man, Vol. 65. (Sep. – Oct., 1965), p. 176. ^ Gary A. Polis (1990). The Biology of Scorpions. Stanford University Press. p. 462. ISBN 978-0-8047-1249-1. ^ Mark, Joshua J. "Serket". Ancient History Encyclopedia. Retrieved 4 July 2016. ^ "Ladybug Ladybug (1963)". Retrieved 23 July 2012. ^ "The Lobster-quadrille". The LIterature Network. Retrieved 3 July 2016. ^ Lobster Telephone in the collection of Tate Liverpool, London. Accessed 27-01-2010. ^ Allen S. Weiss (1996). "Between the sign of the scorpion and the sign of the cross: L'Age d'or". In Rudolf E. Kuenzli (ed.). Dada and Surrealist Film. MIT Press. pp. 159–175. ISBN 978-0-262-61121-3.